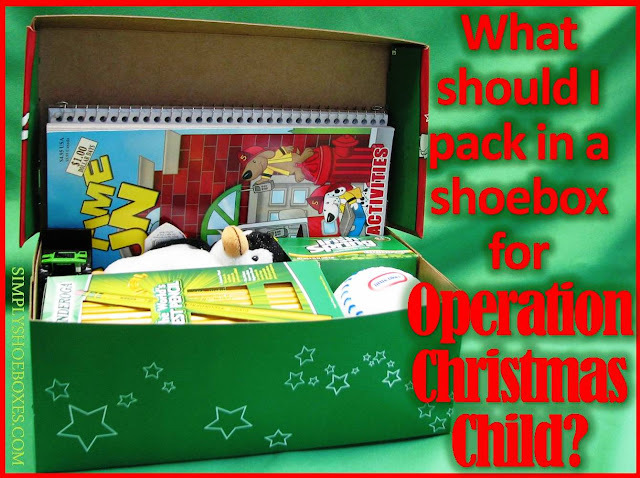 People often ask "What should I pack in an OCC shoebox?" 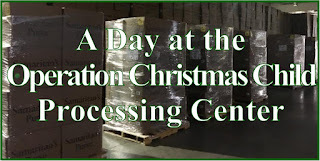 There are almost as many varieties of what can be packed as there are people packing. That's what makes it fun! 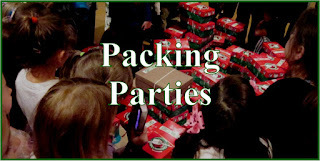 We have divided our items for packing shoeboxes into categories to be sure we remember to include all the things we like to include. 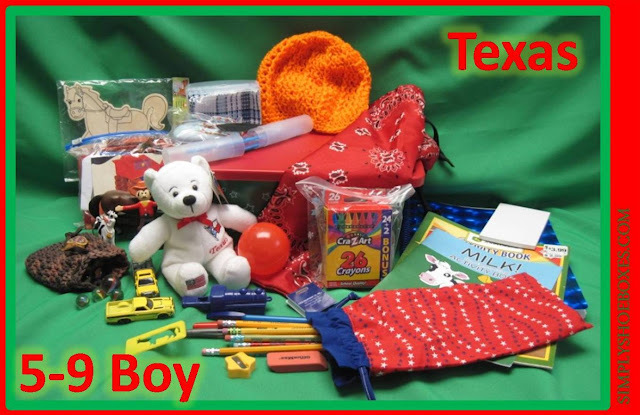 Below is a list of our categories and possible items to include--the starred ones are ones we always include, the others we include in some shoeboxes, but we always include something from each category. 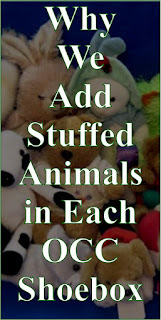 We sew many of the clothing items. 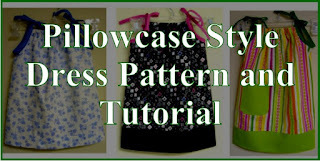 Click for tutorial and pattern for dress. Bags we sew to include. 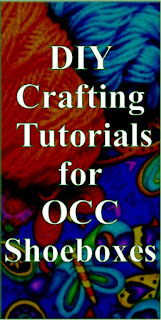 Click for pattern. 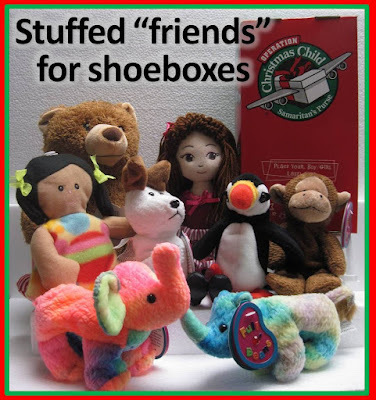 Each Saturday we share what we have purchased or received as donations for our shoeboxes. 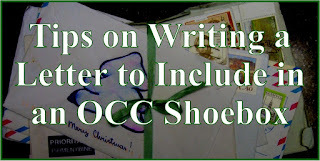 You can look thru those posts here if you want more ideas: OCC Shoebox Stockpile Saturday Posts. 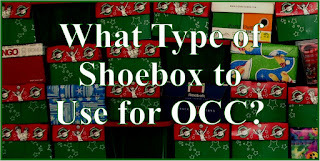 You can also click the images below to find posts with examples of OCC shoeboxes we have packed for each group. 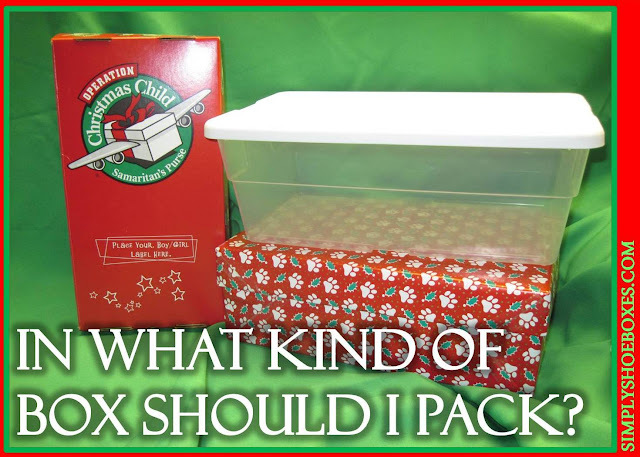 We also often do theme shoeboxes. 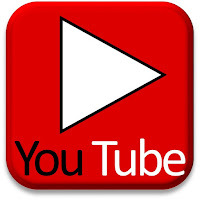 Centered around a color, an animal, a ball team, a hobby, a state, or just about anything. Our themed shoeboxes still have all the items on our must pack list even if they don't fit the theme. 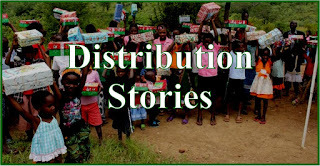 Click the image below to see the posts about some of our past themed shoeboxes. 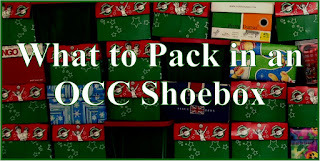 There are several things you can not pack in a shoebox. 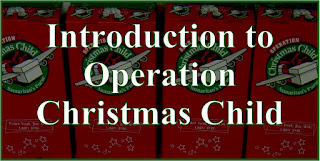 According to the Operation Christmas Child shoebox website you cannot pack: "Candy; toothpaste; used or damaged items; war-related items such as toy guns, knives, or military figures; chocolate or food; seeds; fruit rolls or other fruit snacks; drink mixes (powdered or liquid); liquids or lotions; medications or vitamins; breakable items such as snow globes or glass containers; aerosol cans." 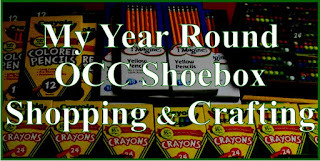 If you have an item that is not on this list and you are not sure if it can be included check out the OCC FAQ page: Can This Go in My Shoebox? 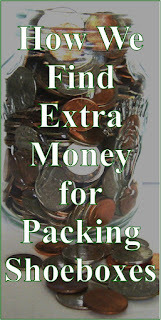 And finally, what to pack in. 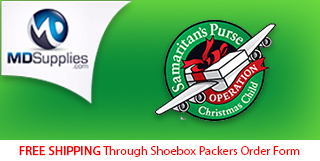 Click the image below to see details on the differences in shoeboxes used to pack Operation Christmas Child shoeboxes.